Cells were discovered in 1665 by an English Botanist, Robert Hooke. He used a primitive microscope to observe cells in a cork slice. 2. Why is the cell called the structural and functional unit of ? Cell is the smallest unit of life and is capable of all living functions.All the living organism are made up cells and also all the processes taking place inside the body of organism are performed by cells.All cells vary in their shape, size, and activity they perform. In fact, the shape and size of the cell is related to the specific functions they perform.Cells are the building blocks of life. This is the reason why cells are referred to as the basic structural and functional units of life. Diffusion is the spontaneous movement of molecules from the region of higher concentration to a region of lower concentration.Concentrations of carbon dioxide is high inside the cell whereas the concentration of CO2 is low outside the cell. Therefore, by the process of diffusion, CO2 moves from a region of higher concentration (inside the cell) towards a region of lower concentration (outside the cell). The passage of water from a region of high concentration to a region of low concentration through semi-permeable membrane is called as osmosis. amount of substance dissolved in water. The outermost covering of cell that separates the contents of cell from its external environment is called plasma membrane. It permits the entry and exit of some material in and out of the cell ,therefore it is called selectively permeable membrane. 2 Nuclear region : poorly defined because of the absence of a nuclear membrane, and is know as nucleoid. 2 Nuclear region: well- defined and surrounded by a nuclear membrane. 3 Chromosome : single 3 More than one chromosome. 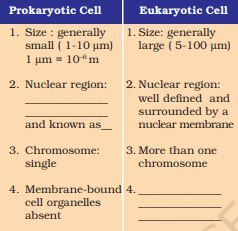 4 Membrane bound cell organelles are absent. 4 Membrane-bound cell organelles such as mitochondria, plastids etc are present. Mitochondria and plastids are the two organelles that contain their own genetic material. Cell is the smallest unit of life which is capable of performing all the basic functions.If the organisation of a cell is destroyed due to some physical or chemical influence then cell will not be able to perform the basic functions like respiration, nutrition, excretion etc.All the life processes will stop and it may result in death. Each lysosome is a small vesicle surrounded by a single membrane and contains enzymes.They remove worn out and poorly working cellular organelles by digesting them to make way for their new replacements.They are called suicide bags of cell.During break down of cell structure, when cell gets damaged, lysosomes may burst and enzymes eat up their own cells. 4. Where are proteins synthesised inside the cell? Ribosomes are very small structures found either in a free state, suspended in the cytoplasm, or attached to the surface of the endoplasmic reticulum.Ribosomes are the site for protein synthesis. Animal cells are generally small in size. Plant cell are larger than animal cells. Except protozoan Euglena no animal cell possess plastids. Plastids are present. Cell wall is absent. The plasma membrane of plant cell is surrounded by a rigid cell wall of cellulose. They are unicellular They are multicellular. Plasma membrane regulates the movement of substances in and out of the cell by the process of diffusion or osmosis.If the plasma membrane ruptures or break down , then the cell will die.The internal composition of the cell will be lost and it will not be able to perform the basic functions.The cell will not be able to exchange the material with the surrounding. They are involved in synthesis of cell wall, plasma membrane and lysosomes.It produces vacuoles which contain cellular secretions eg: enzymes, protein, cellulose etc. They act as an area for storage, processing and packaging of various cellular secretions. If golgi apparatus is not present in cell then all these functions will not be possible. Mitochondria are tiny bodies of varying shape(cylindrical, rod-like, spherical)distributed in cytoplasm. Each mitochondria is surrounded by double membrane.Outer membrane is porous.Inner membrane has folds and therefore have large surface area.They uses oxygen to oxidise carbohydrates and fats present in the cell to carbon dioxide and water.Oxidation releases energy,a portion of which is used to form ATP. Amoeba takes in food using temporary finger-like extensions of the cell surface which fuse over the food particle forming a food-vacuole . Inside the food vacuole, complex substances are broken down into simpler ones which then diffuse into the cytoplasm. The diffusion of water or solvent from a region of higher concentration to a region of lower concentration through a semi permeable membrane is called osmosis. 1) Water gathers in the hollowed portion of B and C because water enters the potato as a result of osmosis.Since the medium surrounding the cell has a higher water concentration than the cell, the water moves inside by osmosis. 2) Potato A in the experiment acts a control set up.No water gathers in the hollowed portion of potato A. 3) Water does not gather in the hollowed portion of potato A because potato cup A is empty.It is a control set up in the experiment. Water is not able to enter potato D because potato used here is boiled.Boiling denatures the protein present in the cell membrane and thus disrupts the cell membrane.For osmosis semipermeable membrane is required which is disrupted in this case.Therefore osmosis will not occur. Hence water does not enter the boiled potato cup.